While the Green Bay Packers loss to the Arizona Cardinals officially ended any slim hopes of a playoff push, while also ending the tenure of Mike McCarthy, there are still a lot of things to keep fans engaged for the rest of the season. I’m most excited to see how the young players perform the rest of the season. I really think Equanimeous St. Brown is going to be a really good player in the future. I love to see his development as he continues to learn to run routes and is developing a relationship with Aaron Rodgers. I want to see if any of the young offensive linemen step up. Do Justin McCray, Lucas Patrick, Jason Spriggs, or Gerhard De Beer have what it take to be starters in the NFL? I’d love to see Josh Jackson get more comfortable at playing on the outside. I want to know if Josh Jones can be starting safety in the NFL. And I’d really love to see Kendall Donnerson get called up from the Practice Squad. Yes, I’m selfishly banging the drum for my own guy here, but I demonstrated before the season how that the closest athletic comparison to Donnerson is Von Miller. Now that the playoffs aren’t in the picture, I’d love to see him get off the Practice Squad and get a crack at some playing time. Outside of Kyler Fackrell the Packers get zero pass rush from their edge rushers, so Donnerson can’t possibly play any worse. And I guarantee he will catch a tackle flat footed once or twice and blow past them. Plus if he’s developed any pass rush moves at all, the counters should be wide open all day. I’m also excited to see how the coaching staff handles the rest of the season. 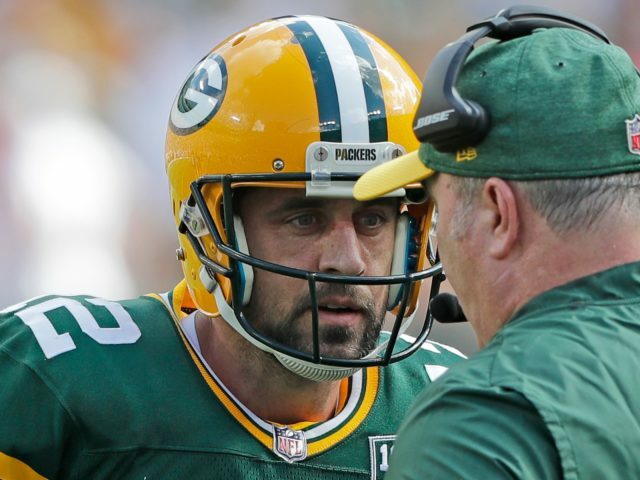 Joe Philbin has to see the writing on the wall, and will probably customize his offense to Aaron Rodgers will a little bit. A happy and productive Rodgers is his best chance to stick around as an assistant or prove his ability to try out for his next coaching opportunity. I’m also interested to see how the defensive coaching staff finishes out the season. They are all interviewing for their jobs with the next head coach, and developing strong ties with the young players on the defense would go a long ways towards solidifying their positions. Watching games that don’t have an impact on a playoff race certainly isn’t as fun. Whether you’re hoping for a higher draft pick or hoping they finish strong to carry momentum into the offseason, there are still plenty of reasons to watch on Sunday. This entry was posted in Andrew Mertig, Packers 2018-2019 Season and tagged equanimeous st. brown, Green Bay Packers, Joe Philbin, Josh Jackson, Kendall Donnerson. Bookmark the permalink.